gift ideas, toys and books for fans of all ages. At the end of your tour be sure to shop at the Rocky Ridge Bookstore. 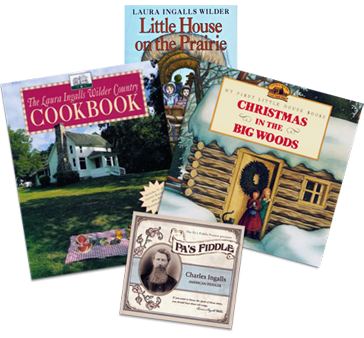 It’s the perfect place to find a special keepsake, for yourself or for a friend, as a reminder of your experience at the Laura Ingalls Wilder Historic Home & Museum. The bookstore is full of wonderful gift ideas featuring a full stock of Wilder books, cookbooks, souvenirs, apparel and collectables. The bookstore also gives visitors an opportunity to support the museum and historical homestead as it is self-supporting and not-for-profit. We rely entirely on admissions, membership contributions and sales from the Rocky Ridge Bookstore. We are grateful to all of our fans and we thank you for your support! Be sure to visit our Online Gift Shop to choose from a selection of the Rocky Ridge Book store’s finest merchandise.